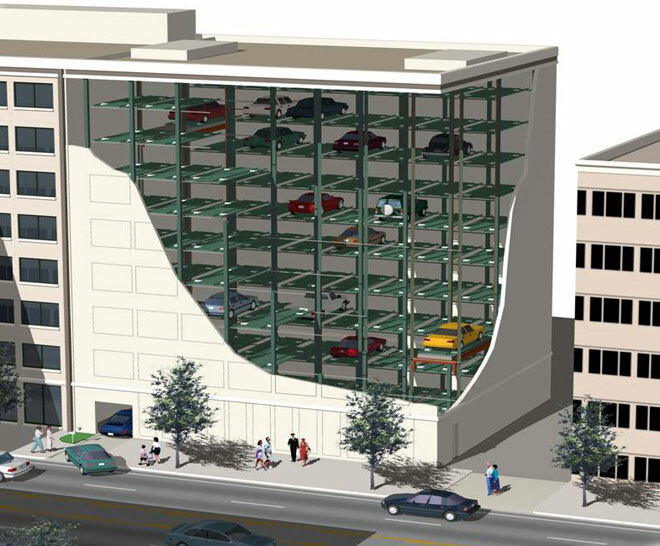 The “smart” intermediate sized automated parking garage. It is an ideal so ution for small sites with a high demand for parking where speed of throughput (# of cars in and out per hour) and percent uptime is important. Our technology offers one of the highest levels of redundancy in the industry, translating into a greater level of reliability. All major components have at least one back up system and in some cases as many as fourfold. No single failure will ever result in the system being inoperable. The HMI (Human Machine Interface) offers one of the most sophisticated systems of diagnostics in the industry. It is an industry first (patent pending) and provides a high level of detection IN ADVANCE of any failures, minimizing downtime. It is understood that any mechanical or electronic component can fail. The beauty of the system is that even in the case of failure, the system continues to operate due to the high level of redundancy and the early warning signals giving the system unprecedented uptime. The facade is completely flexible and can be designed to blend in with the neighboring buildings with a look that is contemporary, historic, traditional, etc. The materials that can be used are completely versatile as well — concrete, wood, brick, stone, aluminum, etc. It is completely up to the imagination of the owner and his architect. From a user perspective, it is a very safe and convenient system. The system virtually eliminates the risk of any vehicle damage or theft and the risk of personal injury or robbery that can occur in regular parking lots because drivers remain safely outside the building at all times. Imagine, arriving to your destination. Rather than having to spend an exorbitant amount of time driving around looking for a space to park, you drive right up to the garage, drive in at ground level into a well lit easy access entrance area, get out of your car, push a button and then you simply walk away. Hassle free! Underground applications are particularly well suited for this system. Because only half the space is needed, one can realize as much as 50% cost savings on the excavation alone. Also, due to lower lighting and ventilation requirements (since no cars are driving around and no one is walking inside), lower insurance costs, lower personnel expenses, land savings, etc. the overall development costs can be significantly lower than for a conventional garage. In addition, this system offers a pollution free alternative. No cars are running inside, so there are no choking car emissions to have to deal with inside the garage. Also, because cars are not having to circle around and around the block looking for spaces, there is less pollution (and less traffic) from cars driving at slow paces for extended periods of time. They get off the street faster!